. Slate is a name that is now used to describe many different stones with greatly varying characteristics. The primary characteristic for sealing decisions is the absorption rate - see below.
. Approximately 5/16 to 3/4 inches thick with a wide range of colors.
. The name Slate has evolved into a term that can be used for many types of cut stone, but we will concentrate on this page with the generally understood types that are called slate. See other pages for different types of stone that might be called slate. For instance "Bluestone" and "Quartzite".
. This is a sedimentary material that has been created by layering in stream beds.
. Indian and Chinese slates are dense and soft, of many variegated colors.
. Brazilian slate is typically dense and hard, interesting colors and patterns of color.
. The correct sealer will increase the strength and durability of all slates.
. "Gauged" slate is sawn to a uniform finish height so the end result is a smoother floor. 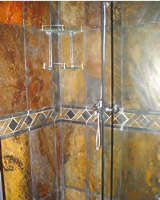 It is also less expensive to install by $1.00 to $2.00 per square foot.
. "Ungauged" slate is not sawn and split to size. Some pieces will be thicker than others and results in a less smooth, more rustic floor. The height variations cause a slower and more expensive installation. Slate is a name that is now used to describe many different stones with greatly varying characteristics. The primary characteristic for sealing decisions is the absorption rate - see below. Traditional beauty with a great variety of colors, finishes, and shapes allow for a wide spectrum of rustic to sophisticated design options. Also used for wall cladding. For large commercial projects wall cladding that will be caulked, click here. Quartzite stone is very dense and can sometimes be found mixed in pallets with the softer slate pieces. See the Quartzite page for more detail on this harder stone. Choose the sealer based on this less absorbent stone and let the more absorbent stones have more sealer. Some Indian and Chinese slates will flake and powder from foot traffic. This is not rust or other minerals coming to the surface. These are spots of softer material becoming loose particles. To see how to deal with this problem, click here. Some slates may be quite hard, but have a soft spot that can powder out. The powder residue is the same color as the slate. This is not efflorescence as that is a white powder. To prevent this gradual removal of slate that turns into a bigger and bigger hole, choose a sealer here that is classified as "strengthening". Cement residue from grouting is difficult to clean from slates with ridges, crevices and holes. Do not use a sealer as a grout barrier (pre-seal). 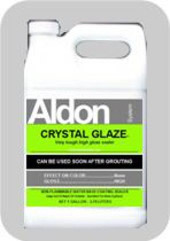 Prevent grout smears, surface scratching and keep grout residue out of surface texture by coating with Aldon "Grout Easy" before grouting. "Grout Easy" is a water soluble coating that comes off easily while grout is being cleaned up with water and a sponge. Some black and brown slates (if unsealed) can lose color from aggressive cleaning. Click here for color restoration. Some slates have almost zero absorption and a surface that can darken in patches from cleaners, chemical action, and/or scrubbing action. This can be prevented by sealing with S-B-S Sealer. #2. If the Slate tile is grouted, but grout is not sealed. #3. If the Slate tile has been sealed in the past. Black Slate - unsealed, raw. A low absorption stone but it is absorbing water at the arrow. Any darkening under a water drop indicates it will stain and must be sealed. "Same Day Sealer" on Slate Tile. This sealer is Water Base | Penetrating Type. Provides: No color enhancement or gloss. Coverage guidelines (depending on absorption) 250 to 600 sq.ft./gal. Black Vermont Slate with 1 application of Same Day Sealer. Water drop shows high bead. Black Vermont Slate with 1 application of Same Day Sealer plus 1 application of Lifeguard to create some gloss. Showing Vermont slates because they are typically very dense and low absorption. 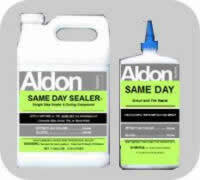 Same Day Sealer is appropriate for any slate that tests for sufficient absorbency. Test slate with water drops. Same Day Sealer is a water based sealer that must all penetrate, therefore, the slate must be able to absorb a water drop in 3 seconds. If the slate is not sufficiently absorbent, see S-B-S Sealer for greater penetration ability. 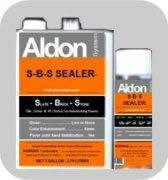 "S-B-S Sealer" on Slate Tile. This sealer is | Solvent Base | Penetrating Type. Provides: color enhancement | low gloss | strengthening | efflorescence barrier. Coverage guidelines (depending on absorption) 150 to 500 sq.ft./gal. S-B-S Sealer is a low solids sealer that is perfect for Slate tile projects. In addition to sealing and protecting, it creates some color enhancement and an easier to clean surface. Brazilian Slate with 1 application of S-B-S Sealer. S-B-S Sealer has the best ability to penetrate into this very dense, low absorption slate. "Crystal Glaze Sealer" on Slate Tile. This sealer is | Water Based | Coating Type. Provides: little or no color enhancement and high gloss. Coverage guidelines (depending on absorption) 350 to 600 sq.ft./gal. "Crystal Glaze" provides a high gloss, very tough finish in one application. Indian Slate with one application of Crystal Glaze. Some color enhancement and a high gloss tough coating. 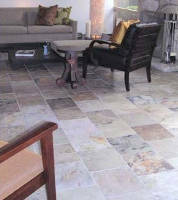 Easy Care Products: for a Slate floor or wall. "Maintain" - for no streak wet mopping of Slate and all other types of flooring. You may have heard of concerns about Slates. All of them would be prevented with the information we provide here. Therefore, you can have the floor you want!